A string quartet is usually made up of two violinists, one cellist and one viola player who are often classiclly trained musicians however the talents and skills set of these fabulous musicians means they are able to play a wide range of types of music! Read on for more information about hiring a String Quartet for a wedding or other event. Find a String Quartet for hire near you in minutes! Option 1. Enter your event location below & contact a String Quartet directly! Option 2. Request multiple quotes from available String Quartets Get Quotes! Option 3. Read information & advice on hiring String Quartets Read Advice! There’s nothing quite like the sound created by the combination of instruments in a string quartet – that wonderful alchemy that occurs when two violins, a viola and a cello are played in unison. The string quartet was developed by the Austrian composer Joseph Haydn in the 1750s, since when it has come to be considered one of the most prestigious forms of musical entertainment, reserved for those occasions that require that extra touch of elegance and sophistication. Despite their classical roots, most string quartets can be remarkably versatile. Many quartets can play a diverse repertoire, covering everything from Pachelbel's Canon in D or Arrival of The Queen Of Sheba, to Jazz classics, show tunes and even contemporary rock and pop songs like Oasis’ Champagne Supernova, Elton John’s Your Song or Clocks by Coldplay. To bring a really modern note to a truly classical form, some of the many groups in our directory even offer the option of including electric instruments and rhythm and effects pedals. The main considerations when deciding if a String Quartet is right for your event are space, cost and musical taste. It’s likely that a String Quartet will need an area of around 20ft x 12ft (6m x 3.6m) in which to set-up and perform, as well as plenty of space around them so that guests aren’t too close and the music can be truly appreciated. This is a fairly large space and you will need to check your venue is able to accommodate this type of group before you book. 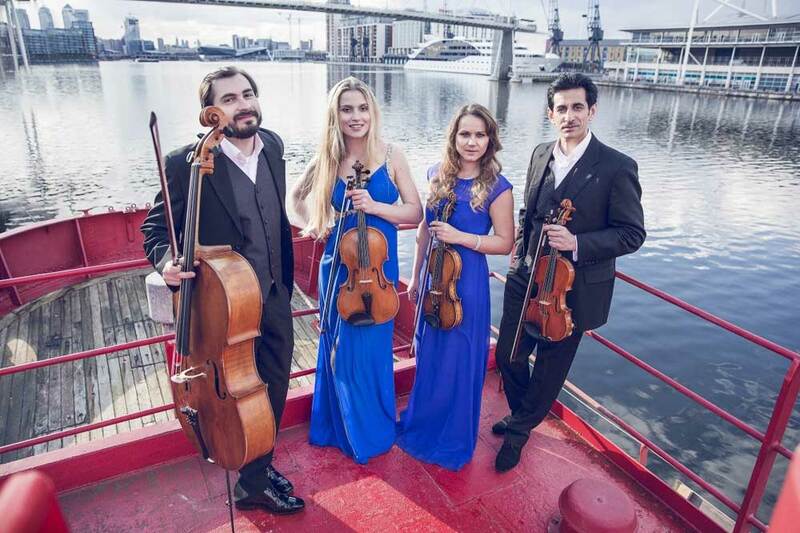 When you book a String Quartet you are hiring four classical trained musicians, who will have been practising since they could read and hold an instrument and who have reached a very high level of technical skill and creative artistry. For this reason, although good value for the incredible effect they produce, they are not for the smaller budget. Further cost details can be found below. A String Quartet creates the most divine sound and can serve just as well as background music or the main focus for an event, depending on the set and type of music you would like them to play. They are true musical professionals and are often able to recommend the ideal set or playlist for any event. The only consideration here is that this tends to be a more calm and sophisticated form of entertainment and perhaps less suited to a high-energy party where you’re hoping to get your guests up and dancing. A Quartet is ideal for marking very special occasions and events, such as Christenings, Weddings, Birthdays and Funerals. For a Wedding, you may want to hire a String Quartet to play the musical parts of your wedding ceremony, before offering gentle background music for your wedding drinks reception and/or wedding breakfast. They also offer perfect entertainment for Galas, Charity and Corporate events where they can set a truly elegant and sophisticated tone, bringing a touch of sparkle and true glamour to your occasion. You will find that some groups are very versatile and can offer solo, duo or trio packages, as well as a quartet, meaning you can hire the group for the duration of the your event and vary the entertainment by changing the arrangement. How much will a String Quartet cost? It takes years of training and a very high level of technical expertise to produce the unique sound and performance that comes from these four musical instruments being played together. Musicians need to practice regularly and have top-up lessons as well as buying and maintaining their high-quality instruments. To hire four wonderfully skilled musicians, prices start at around £500 ($650 or 550€) and go up to around £1000 ($1300 or 1100 €) for highly experienced groups. Prices may also increase during busier times of year, such as Christmas and New Year’s Eve. This would normally cover a two hour set, usually broken into two performances. However, many quartets can offer longer sets if required, just check with them when booking. The quickest way to find the right String Quartet in your area is to use our search function. Just add your location and click search to see a huge variety of acts to choose from. Our latest testimonials are also a fantastic way to start getting some ideas for your shortlist. With a String Quartet the perfect way to assess if they are right for you is to look at their genre and set-list and most importantly listen to their recordings. Once you’ve found your ideal act, just contact them direct! Even better, if you would rather entertainers came to you, you can request multiple quotes here, and this service is completely free! Booking a String Quartet can make all the difference to your event, and we know we have exactly the right group on here waiting to fill your party with that air of sophistication and hint of sparkle. We hope you enjoy your search but do contact us if you need any help. WANT TO RECEIVE A RANGE OF QUOTES FROM String Quartets?